It’s 14 Degrees Outside….Do Hobbits Work When It’s This Cold? Yeah Hobbits are a little wiser than us. They hunker down for the winter in front of a nice warm fire with a good book or in the company of some friends and family. Sounds like a plan. Simple. Just let the winter run its course and wait for spring. Oh, to live the Hobbit lifestyle. We’re all getting ready for the upcoming movie of course. The Hobbit: The Desolation of Smaug. Ethan and Georgia were back from college for Thanksgiving so I had ordered the extended version of the first Hobbit movie a couple of weeks ago. For some reason it was on backorder on Amazon but I figured it would be here by this weekend. I was wrong. It’s not going to get here for another couple of days so I figured I would just go out and buy a copy for the weekend. But nobody had it. Not Best Buy, Target, or the mighty Walmart. What’s up with that? We watched the regular version instead. Bilbo is great. I mean you’ve gotta love Bilbo. Can’t wait for the next movie. I think I’ll take the 13th off. As a matter of fact, why don’t we all take that Friday off and have a Hobbit party! So let’s get back into building a Hobbit house shall we? My three sons were back this week for the first time in a long time. Larry, Moe, and Curly. I mean Ethan, Jude aka Crash (He still owes me by the way) and Terence the Good. We also had RJ ( Who actually has a pretty good singing voice) and Egzon (The only Albanian with poor blood circulation). I paired Ethan and Egzon up and they continued with the plywood installation. It being 14 degrees out we had a little frost problem on the existing plywood. 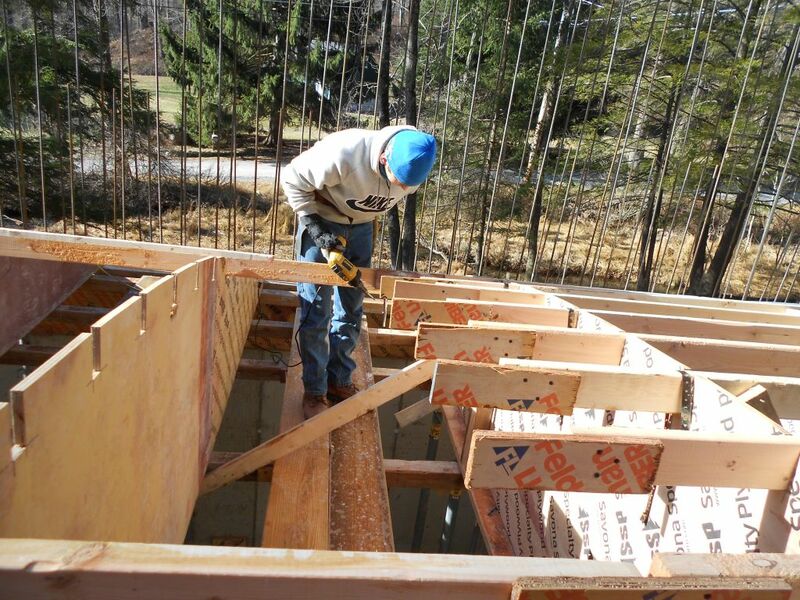 HDO plywood or plastic plywood as some call it is slippery without frost on it to begin with. This being a curved roof and all made it extremely dangerous to work on. They had to go slow and take their time but they got used to the frost cover and came up with a few safety techniques that worked really well. 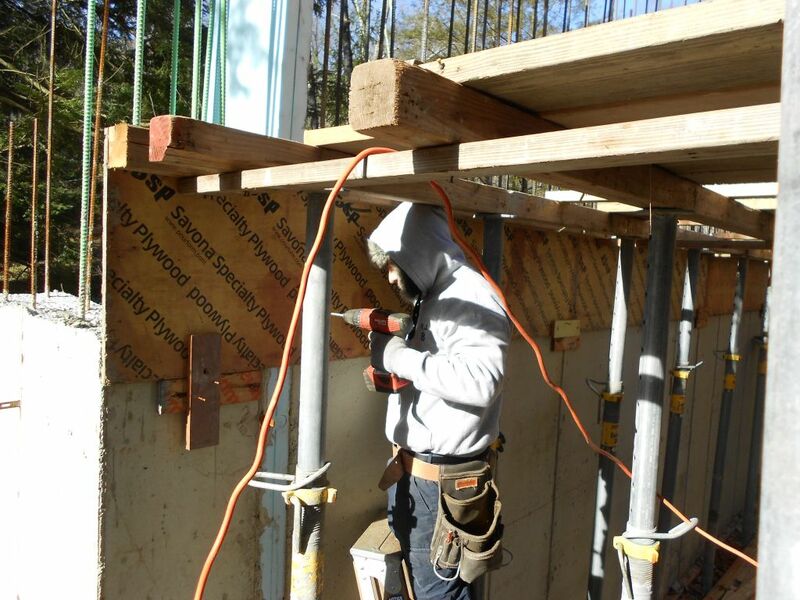 Here’s a picture of them installing the sheathing. 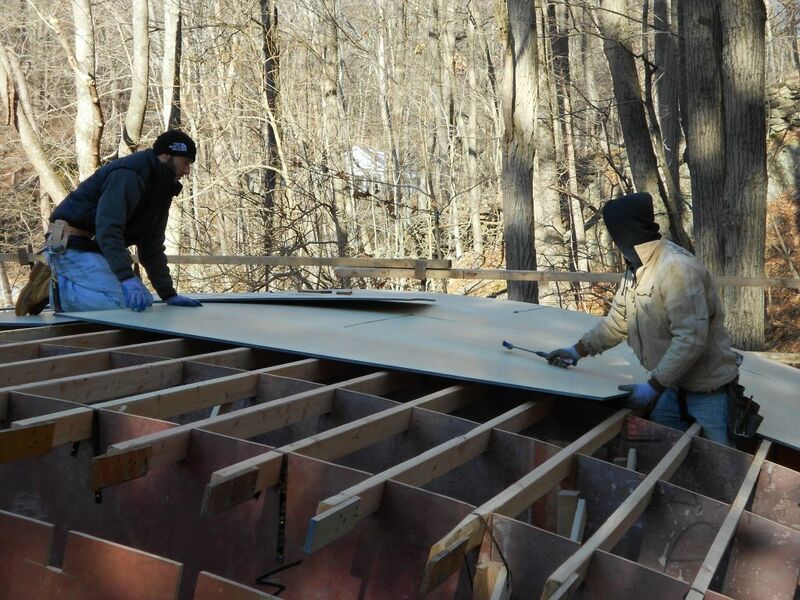 Egzon and Ethan installing the roof sheathing. 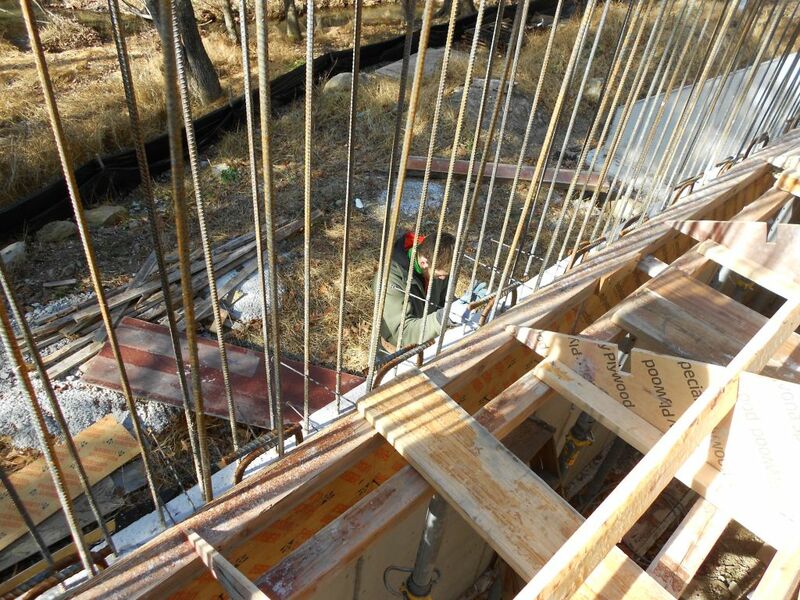 One of the things I was a little concerned with was the bracing of the decking for the concrete pour. I’m having second thoughts about that now. After Ethan and Egzon nailed a few more rows of plywood you could really feel the whole structure start to stabilize. I don’t think I’m going to have to brace up the structure as much as I thought I was going to have to. Jude and RJ were given a special task. Begin the dreaded snap tie and waler installation. So the wall extension, which was one of the first things we did after the removal of the symmons forms, have to be secured for the concrete pour. The concrete pour is going to extend about 2 foot 6inches above the top of the existing wall. Ususally we would only put one tie through a wall this high but things being the way they are I wanted one tie directly under the 4×4 at the top of the wall extension. That being said there really would have been a little too much space from that tie to the top of the wall. Of course that is where the greatest pressure is during the pour. Let’s put two rows of ties in shall we? Jude and RJ need the practice anyway.When everything is locked up and finished it looks like it was easy putting this kind of stuff together. But it’s not easy and I knew it wasn’t going to be easy. Once they got going they did fine though and I was happy with the progress by the end of the day. Here’s a couple of pictures of them doing their thing. Hopefully this will clarify what I was just talking about. Check it out. Rj drilling for the snap ties. Jude putting in the snap ties from the outside in. Terence on the other hand worked as our go to guy and he also added all the cleats onto the two by fours so we could splice them together. Last week we used nails to do this but it was kind of slow. I bought some inch and a quarter drywall screws and brought the screw gun up and Terence went to work. Here he is. Terence cleating the 2x4s together. I pretty much tried to keep in front of Ethan and Egzon doing the miscellaneous stuff that needed to get done for them to keep going and working square. The other thing I wanted to try and do this weekend was set up the router to cut our detail squares for the interior and exterior detailing. 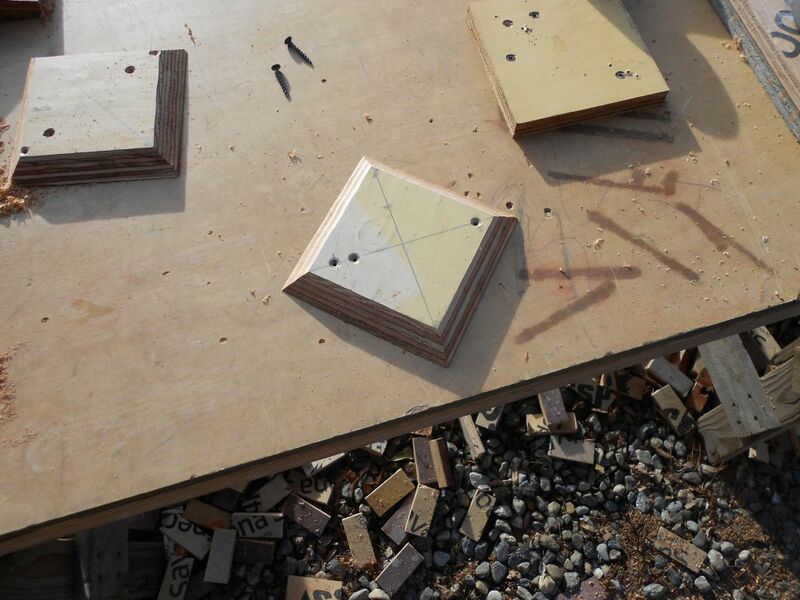 These squares have to have 45 degree angles cut into them so that after we pour they will be able to be stripped out of the formwork. When I did the Hobbit Shed in my backyard I actually cut 3/4 inch skew back trim to fit around each square block. This was very time comsuming. I came up with this idea while driving to work one morning. It worked like a charm. Check it out. 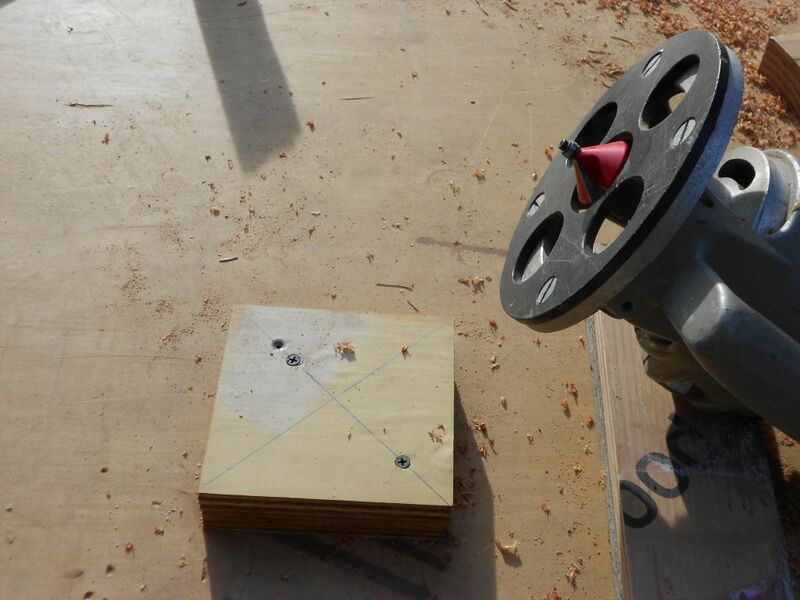 45 degree router bit with a square detail block scewed to another block cut the same size. Once this is set up you just start the router and go right around the block with it. Finished detail block.Perfectly fortyfived all the way around. No headaches. I’d like to go on some more but I have some other work to do before the night is through. Here’s the deck by the end of the day Saturday. Moving right along wouldn’t you say? I can’t believe there’s only 24 more days until Christmas! Less than two weeks until the Hobbit comes out! Have a wonderful week! Until next time…take care! 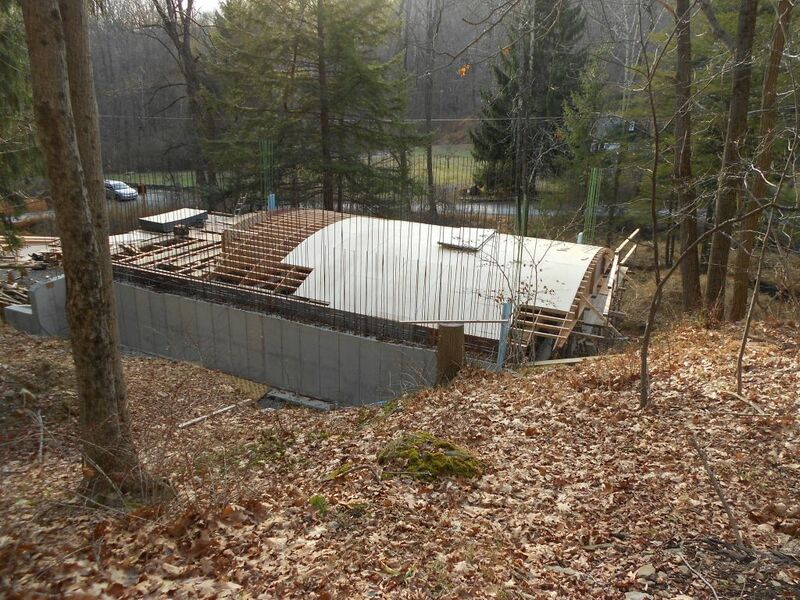 A Roof and Ice Mix….A Neighbor Wants to Help…Huh? Sally: This is pretty interesting. I’m not going to be doing inlays like this. Mine will be more geometrically driven. The one item I might try to do is do leaf imprints. I have to experiment with that at work though. When and if I do I’ll put it in the blog. Are you going to use your detail blocks just in the ends again, or are you going to do some details on the ceiling? Hi Sally! So glad to hear from you again. Right now I have three different sized detail blocks that I’m going to use. Yes, I will be using them in the ceilings as well. I have a lot of ideas for the ceilings and quite a few sketches for each room. I’m going to try a few differnet things in this house. I’m not exactly sure how I’m going to handle the ceilings.I’m sure that once I start I will change what I originally came up with. This is one of the items that I am really looking forward to working on. Thanks again for writing! I come read this blog at least once a week, so be sure I’m keeping up, even when I don’t comment. I’m kinda fascinated with building projects right now, what with getting ready to start my own. Hi Sally. So what is your project exactly?